If you’re new to the horse show world, or simply new to jumpers, you might be a little confused about what each class is and how it operates. What are these tables? Are we jumping them?! What are all these numbers and letters? Stay calm. We’re here to help. Here are a few of the most common jumper classes you will encounter at a show and how to navigate them. This is perhaps the most common kind of class you will encounter at shows, especially if you are newer to the sport. When you enter the ring, you’ll hear a buzzer, after which you have 45 seconds to cross the start line to begin your round (If you don’t begin in time, the timer for your round begins anyway, so you’ll have to be that much faster to not incur time faults). Competitors jump their course within the time allowed, and hopefully go clear by not taking down any rails. If you’re clear, stay in the ring after your round, and wait for the buzzer. After the buzzer, begin your jump-off course, which will be a shorter and amended version of your first course. Hopefully you memorized it beforehand, but if not, you can always frantically scream “Where am I going? !” at your trainer. But we wouldn’t recommend that. For the jump-off, aim to go fast and make handy turns. You want to go clear, most importantly, but you also want a faster time than everyone else as well. Don’t get too crazy, though. Nobody likes a scary round. These are often called something like Blue Ribbon or Clear Round classes. Essentially, the goal is simply to go clear within the allowed time. If you do so, you get a blue ribbon. These are great classes for when you’re new to a competition height. These classes are speed rounds. There is no jump-off, so you need to aim to go clear and fast. Tight turns are again your friend here. 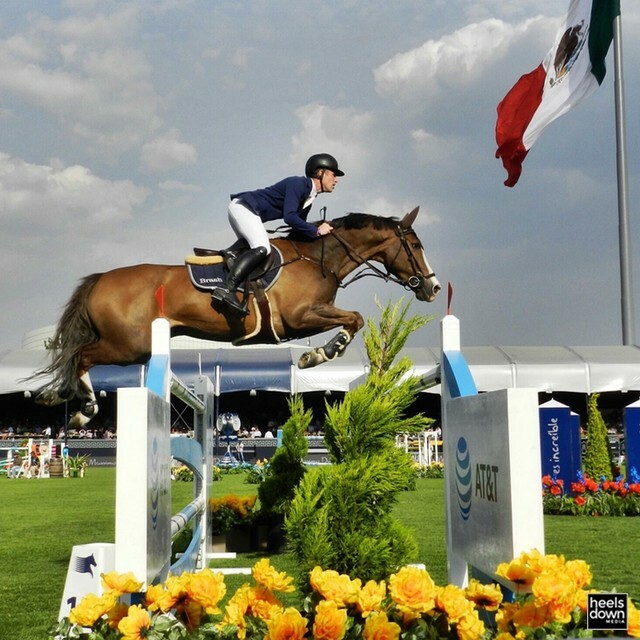 Rounds are scored by faults and time taken, so essentially the fastest clear round will win. In this format of class, everyone jumps their first round, aiming to go clear and within time allowed. After everyone has jumped, those with clear rounds come back for the jumpoff, which is a shortened version of the first course. Time to go fast! Grand Prix classes are often run under this format. But if you’re new to the sport, you’re likely not doing those. I hope. This is another common type of class, called Power and Speed. The course is divided into two parts, with the first being the “power” part, and the second being the “speed” portion. If you go clear and within time for the power part of the course, you immediately – without stopping – continue to the speed section of the course, in which you aim to go a bit faster. Essentially, it’s like having the jump-off without stopping your ride. This can end up being a long total course, as the power phase can be 8 to 10 jumping efforts, and the speed phase can be 5 to 7. So, remember to breathe. Several other kinds of jumper classes exist, but if you’re new to the sport, you’re not likely to be taking part in a puissance (please don’t scare your trainer) or other such classes. The ones above will likely cover you. Of course, there are also so many other rules for competition that you’ll want to brush up on beforehand, including the ever-important question of what to wear. For more info, take a peek at USEF’s rules for the jumper division.